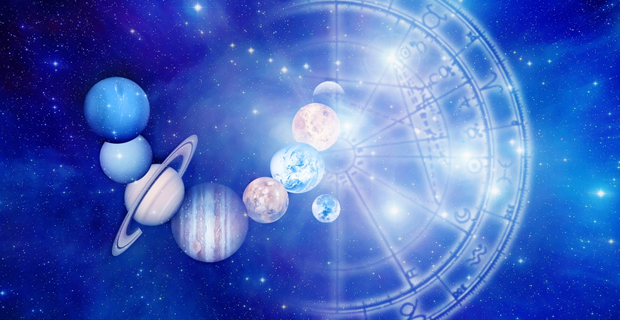 Financial astrologers study the cycles in speculative markets with reference to planetary cycles and harmonics. Gann wrote about wheels within wheels, or larger cycles containing smaller cycles all vibrating according to their periodicity. So what is the first step in analysing a Stock? Financial astrologers start with a natal chart either an incorporation date of the company in question or alternatively, the day and hour the stocks are listed on the exchange. Markets are controlled by emotions and on the date of listing, there is a certain culminating emotion and expectations by the company and prospective shareholders. This symbolic birth creates a vibration that astrologers use as the base to make future predictions. We have copies of Gann’s horoscopes he cast for commodities and mundane affairs for the USA. Below in Chart 1, I have cast a chart for the listing of Telstra on the ASX 17th November 1997 at 10.00 am Sydney, Australia. In company charts, the Sun represents the central energy of the corporation, its vitality and leadership. The Moon is symbolic of the public and the shareholders. Therefore, the luminaries are the start of any analysis and we can also use their midpoint as a focal point representing the relationship between the company and the public. 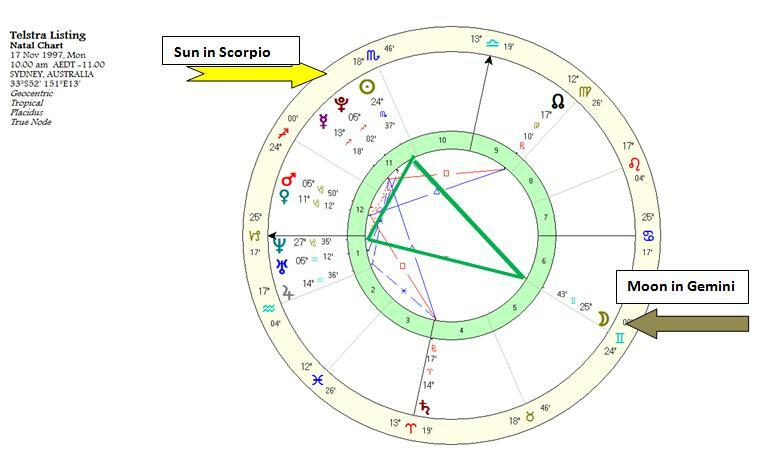 In the natal chart below, you can see that I’ve highlighted the harmonic formation between the Sun, Moon and Neptune called a Yod or the Finger of God. The Moon at 25° Gemini becomes the obvious focal point of the in the Telstra chart. Using the natal chart as a base, we then look at significant highs and lows in the stock – enabling us to determine sensitive degrees in the horoscope. Chart 2 below shows the natal chart in the centre surrounded by the planetary transits of the all time high (ATH) on the 2nd Feb 1999 at $9.20. Jupiter the planet of expansion at the time of the ATH was forming a positive Trine (120) aspect to the Sun and also a Square (90) to the natal Moon. These two aspects are the foundation of Gann’s Emblem and understanding planetary harmonics. This was the all Time high so far for Telstra plotted below on a weekly chart. Now what can I do with this information? I can plot a planetary return of Jupiter to this position at the high and divide by Gann harmonics of 3rds and 8ths. The cycle of Jupiter around the Sun is approximately 12 years, 12×12 equates to 144 months, one of Gann’s favourite squares ( see chart 3). 144/3 = 48 months, 144/4 = 36 months and 144/8 = 18 months. Using the Gann box as a square of 144 you can clearly see the 4th harmonic (90) bringing in highs in the late mutable signs and the 3rd harmonic (120) lows in the fixed signs. Chart 4 shows this 4th harmonic overlapping cycle using the cycle of Jupiter. Statistically, more lows when Jupiter is transiting in the fixed signs of Taurus, Leo, Scorpio and Aquarius whereas more highs while transiting through the mutable signs of Gemini, Virgo, Sagittarius and Pisces. Unfortunately for Telstra its Jupiter return on the 22 May 2010, did not once again promise expansion and optimism of 1999, this year in the heavens there are three interfering cycles, causing contraction , chaos and decay. Jupiter is forming an opposition to Saturn (planet of restriction) while a conjunction to Uranus (chaos and change) and another square to Pluto ( transformation and death), known as cardinal T-square on the 4th harmonic which is hard angular energy. Therefore, the expansion is literally contained tightly in a box slowly building pressure and as a result, price can’t accelerate and stays flat within a small trading range. These interfering cycles are also the reason why known cycles can suddenly invert over time, we have to look at the whole, not rely on one planetary cycle to gives us the information.